For some time, I’ve thought the notion of curation had some relevance as a model for teaching in rich, networked learning environments. An early proponent of this connection was George Siemens (short presentation here on Leigh’s blog). It’s also a role that has been talked about between Keira and myself in terms of how SLAS learning parties might be fruitful and multiply. People often ask me which museums are my favorite. I don’t like to give a list. I’ve only visited about 0.01% of the institutions out there and I suspect that the other 99.99% includes some real gems. But when I really think about it, all my favorites (so far) have one thing in common. It’s not the extent to which they are participatory. It’s not their size or type or subject matter. It’s the extent to which they are distinctive, and more precisely, idiosyncratic. I understand why retail establishments benefit from becoming bigger, more homogeneous, and more distributed. People like to buy from chains because they know what they are going to get. But consistency should not be the number one value when it comes to providing visitors with educational, aesthetic, social, and hopefully transformative experiences. I’d argue that one of the top reasons people DON’T visit museums is that they think they already know what they are going to get. Especially when it comes to small museums with limited collections, a distinctive personality is often the best thing the institution has to offer. Trying to cover it up or smooth it out in favor of “best practices” does a disservice to the museum and the audience. It creates another forgettable museum. Indeed, if an emerging open educational resources network starts to build something like a shared infrastructure of learning content, the role of somebody working so that learners don’t ‘already know what they are going to get’ becomes all the more vital. The homogenized alternative is too horrifying to contemplate, all too easy to imagine. The term “freeform” is somewhat problematic to me as well, even though it’s what I’ve spent almost my entire live working in. One freeform radio station can be completely different, even polar opposite, from another freeform station. 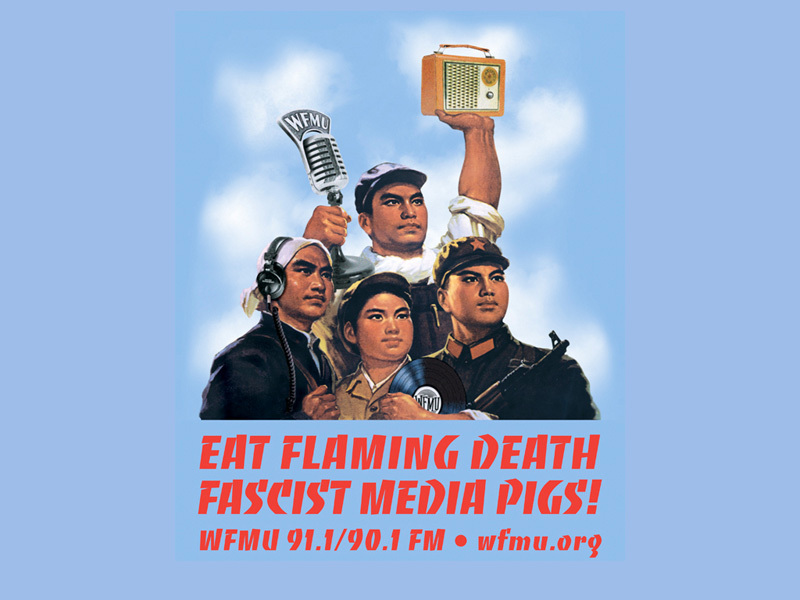 WFMU’s brand of freeform is just one particular brand. We definitely have areas that we focus on, and other areas that we’re ignorant of. We don’t even attempt to touch every genre or everything across the board. It is important not to go for diversity and juxtaposition and as many genres as you can just for the sake of itself; it is important to have some kind of focus. But it’s also really, really important to let programmers act as curators and to let radio stations act as curators. I think that’s what a lot of listeners will be attracted to, in the same way that the heyday of the independent record store — I remember going into independent record stores when I was in college, and I would go into a store and just buy $100 worth of records. I wasn’t familiar with any of them. The only reason I bought them was, I trusted the taste of the people stocking the record store. That was how I discovered a lot of music. I think radio stations have to play the same role. They used to play the same role, and if there is one lesson that mainstream public radio and commercial radio and community radio can take from whatever we’ve done, it’s that radio stations should be acting as curators. Listeners should be looking at those radio stations for their taste and their knowledge and to be exposed to new things that listeners don’t necessarily know. And that act of intelligent curation is so much more powerful than the automated curation that we’re seeing in such automated entities as Last.fm and Pandora. Those recommendation engines are interesting, but I don’t think anything can replace an intelligent human curator. The notion of a radio station as a curator, as a filter, is fascinating to me. Any of us who spend time online or in media can see that this is the time that people need filters, need curators, to help them navigate. They can choose their filters and curators freely, but they will need them if they’re to find something they want. But is it an issue of a core personality for WFMU to have, or a core set of personalities to develop and make, in a sense, reliable for listeners? Is that the essence of good curation? I’m not sure, because I don’t think WFMU is reliable. We’re actually very, very unreliable, and I’m not sure if that’s a strength or a weakness or sometimes both. I myself turn my own radio station off six or seven times a day, sometimes screaming as I turn it off. Then I turn it on again ten minutes later. We’re not afraid to do that. If what you’re getting at is “How do you recreate something like this?”, I have no idea. Nothing could possibly create an entity like WFMU out of scratch. We’ve been on the air for 51 years, and it’s a true community radio station insofar as everybody on the air came from the community of listeners. We’ve put out certain kinds of programming. There’s been a certain musical, philosophical, even comedic aesthetic, and that’s attracted even more people back in who got it, who understood it and were able to add to it. On a managerial level, I’m always interested in bringing people in who get it, but are going to take it in a new direction. I don’t want people who are going to push back the exact same thing we’ve been putting out. On one hand, I want people to get it — I want our new programmers to clearly understand what WFMU is and where it’s coming from, but I want them to take it to new places also. I’d be pleased if a notion of curation as a means of producing surprises and an ethos of going to new places were to emerge out of this field. Obviously, I agree with motivations such as accessibility and economy as drivers for the production and sharing of open educational resources. That said, I can’t get too excited about an educational movement that doesn’t somehow create space for more freedom in day to day life, that doesn’t embrace the wild freaking endless diversity of this crazy planet. I need some dancing at this revolution. Wow, this is so timely for me. I’m doing a presentation this week in which curation figures somewhat prominently, although, I confess I haven’t nearly plumbed as deeply as I need to in my own thinking. You’ve given me some great food for thought. My particular interest for this presentation is about the curatorial activities that people are increasingly engaging in online as part of social networks and social content creation. I think information/media curation may be an indicator of one of those new-fangled literacies (fluencies, skills) we seem to talk about a lot these days. Years ago in graduate school I worked on a software design project for a program that would allow students to curate and share virtual exhibits. It’s not a revolutionary idea, but it’s a key concept that brought me to this discipline and that remains incredibly compelling for me. Martha, I hope you share what comes out in your presentation, I certainly would be interested. And if I understand you correctly, we might be collectively groping toward a sense of new media curation by activities like blogging, networking, etc… I find that somehow reassuring. I think your teacher as DJ came before and goes into the heart of curator – which in many sense a DJ is, with the added richness of creator as well. This post has been timely for me too Blamb, as I think about the horrors behind the Wikimedia Foundation. Your comments on the one big homogenious blob are spot on, relating to your earlier criticisms of OER in respect to whether we even need OER production projects when we have the WWW. My latest idea was the creation of templates for WordPress.com and Blogger, that have navigational aids and a certain level of consistency to assist with the connections.. but this again risks an ugly homogeneity.. If I could just gets some thoughts on how templates could come with widgets, search bars and links that are easily customed by the user so as to aid connection before creating an architecture of control. I think of curation as one way in which we potentially learn to sort through the influx of “stuff” that we encounter online and elsewhere. I hear from faculty all the time who tune out of conversations (online and elsewhere) because they don’t have time to mediate the incoming information. I know I feel that stress, too. I’m sure students are feeling it as well. To me “curation” becomes a means to make sense of that experience — not teaching ourselves to simply consume more and more and more information, media, conversation, data, etc. But, rather, learn how to collect, narrate, and share the pieces that have meaning to us. And I like your idea and Nina Simon’s that serendipity, idiosyncrasy, surprise need to be a part of that as well. The point is not to have everyone narrating the same worn paths through this landscape, but rather to find ways of sharing the unexpected pieces of our curated experiences. Update: I hadn’t seen Leigh’s recent post on the Wikimedia foundation when I posted this comment. Sorry Leigh! Gary – I think we like to learn online in similar ways. Speaking for myself, I always prefer to find an expert prepared to curate resources for me over time (ie blogging), and learn organically — essentially that’s the role that Nina Simon plays for me in terms of conceptualizing how some in the museum community might conceptualize it. Martha – I absolutely agree, and thank you for stating your points so clearly. The time issue is an interesting one, and once again I find myself thinking of Stephen Downes long-held assertion that online learning is a flow, that if we have established a solid network the information will come to us when we need it. And I would suggest that the ability of educators to surprise our students might not just be a humane and human way of promoting learning, but may be essential to preserving a valued role for educators into the future.